Melek , which means ‘angelic’ in Turkish, is a multi-skilled girl who wears a hijab. She is not what her name claims. She is talkative, quick-thinking, a problem-solver, loves to-do lists, and has a Hijabi Barbi and a great imagination. Tien, the new girl at school, is Vietnamese. She loves drawing pictures that ‘tell stories faster than words’. Melek knows about standing out and being different, so she helps Tien settle in. She also has a generous and forgiving nature, saving Zac in the pool, who then insists he was just pretending to drown. Zac makes fun of Melek and her hijab. He’s a show-off, full of excuses and has a pet rat called Rattus Rattus which he frequently smuggles to school. But the possibility of change hovers around him. Lily is keen on dressing up and things from the past. These are the four characters in this story, set in a mainstream school. Many schools have Book Character Parades. 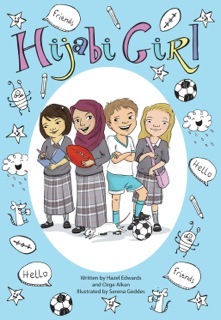 Librarian Ozge Alkan became co-author with Hazel Edwards to create this book after young students’ requests for a book with a character wearing a hijab. There wasn’t one to be found, so Hazel suggested Ozge write her own.